Linux Tour is an initiative from the community of GNU/Linux users in Nicaragua, to promote the usage of free (libre) software and open source in our country. 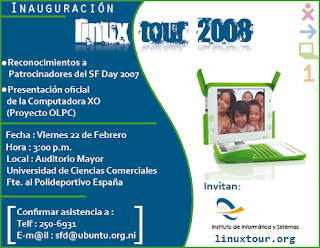 This next 22 friday at 3:00 PM, will start the Linux Tour 2008 in the main auditorium of the Universidad de Ciencias Comerciales (UCC). Please excuse my english, english is not my first language.